Headlines about Pia Wurtzbach's crowning as Miss Universe 2015 on Sunday may have been dominated by Steve Harvey's announcement error, but during the competition, much of the social media discussion around the new Miss Universe was focused on her two question-and-answer session answers. During the first session, Wurtzbach was asked if she supported allowing American military the use of bases in the Philippines. "I think that the United States and the Philippines have always had a good relationship with each other." Wurtzbach responded. "We were colonized by the Americans and we have their culture in our traditions even up to this day, and I think that we're very welcoming with the Americans. And I don't see any problem with that at all." In 2014, President Obama and Philippines President Benigno Aquino III signed an agreement that would allow the United States to rotate troops in and out of the country as well as build infrastructure on the bases in the face of rising disputes in the South China Sea. The agreement was met with resistance from the Philippines' left wing and has been delayed pending review from the Supreme Court of the Philippines caused by a challenge from the country's Senate. The agreement came under fire again when a U.S. Marine was convicted in December of killing a Filipino transgender woman. The reaction from activists in the Philippines was immediate, some saying that Wurtzbach needed to better educate herself about the issues surrounding a possible American military presence, though many of her critics ultimately reiterated their support of her in the pageant. I don't agree with Pia's opinion but what the heck, I hope she wins #MissUniverse2015!!!!! Others still contended that the question was unfair based on the fact that Wurtzbach was giving her answer in front of an American audience. Several politicians and activists offered to speak with her following the pageant to discuss the issue. Wurtzbach's answer to the final question — why the finalist should be Miss Universe — also made an impact online. "To be a Miss Universe is both an honor and responsibility," she said. "If I were to be Miss Universe, I will use my voice to influence the youth and I would raise awareness to certain causes like HIV awareness that is timely and relevant to my country, which is the Philippines." According to UNICEF, the Philippines is one of only seven countries in the world that has an HIV case growth rate of over 25 percent between the years of 2001 and 2009, with much of that growth affecting people under the age of 25. Reaction on Twitter was nearly unanimously positive. One commentator, Filipino performance artist and sexual and reproductive health advocate Carlos Celdran, proclaimed her the winner based on that answer alone. 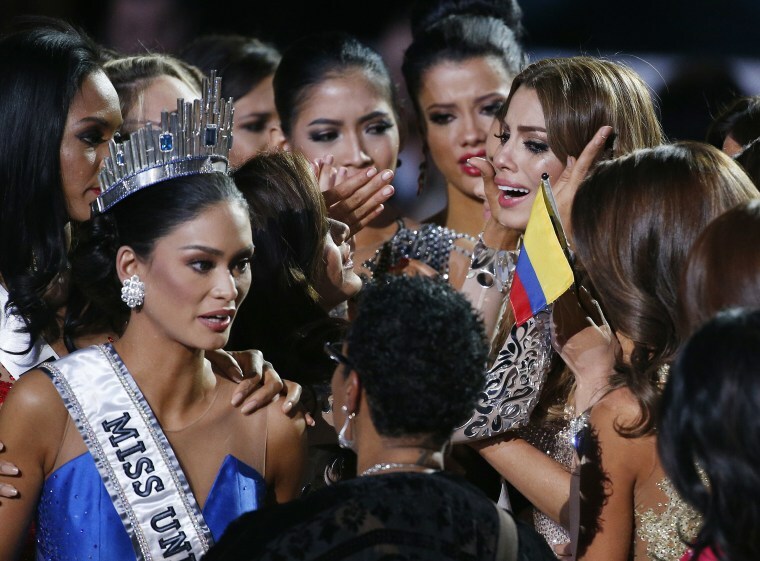 Wurtzbach is the first Miss Universe winner from the Philippines in more than 40 years.